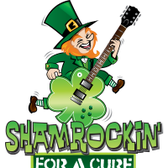 ShamRockin’ for a Cure returns to Alpharetta to rock your night with great food, amazing bands, and of course dancing. Come eat, drink and help cure Cystic Fibrosis with a night filled with music that will rock the Verizon stage while attendees dance the night away. Regular tickets include food, beer, wine, cocktails and giveaways. And they also get you on stage dancing with new an old friends. The exciting live and silent auctions will be packed with something for everyone-trips, dining, adventure, jewelry, gift certificates and a raffle.